I’ve gotten many calls over the years about attics and attic ventilation; almost invariably the caller is confused, having heard different things from different people. In this article, I’ll discuss the performance of attic assemblies and try to shed light on why there are so many points of view about roof ventilation. The temperature of a northern-climate roof we monitored throughout the 1990s is shown below (Figure 1). 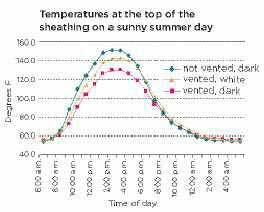 Here is a summary of the study: The roof gets cold at night and is hot during the day. It gets hotter on a sunny day than on a cloudy day. Attic assemblies with openings to the outdoors (“vented” attics) stay a bit cooler during the daytime than unvented assemblies. They also stay slightly warmer at night. Figure 1. Sheathing temperatures are affected somewhat by roof ventilation, but many other factors play a bigger role. Many factors influence the temperature on the roof. A prioritized list might include hour of day, outdoor air temperature, cloud cover, color of the roof, roof orientation, where the measurement is taken (sheathing or shingles, top or bottom), latitude, wind speed, rain or snow on the roof, heat conduction across attic insulation, roof framing type (truss or cathedral), and attic ventilation to the outdoors. As you can see, ventilation falls pretty far down the list. To better understand how wind affects roof ventilation, Canadian researchers T.W. Forest and I.S. Walker measured the air exchange rate in attic assemblies using tracer gases. The graph below (Figure 2) gives us a feel for what they found. That is, air-change rates in the attic tended to increase with wind speed, but the amount of air change at a given wind speed was unpredictable. In fact, even with specific information about climate, construction type, and wind speed and direction, the resulting air-change rates may vary by a factor of 10 or more. Whether air flows out through a roof opening or in through that opening, and whether this airflow induces flow from indoors into the attic or helps dilute and remove moist air from the attic, can never be pinned down very well, except to say that wind is a more powerful factor than buoyancy (the “stack effect”). Figure 2. 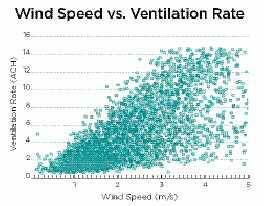 While higher wind speeds tend to increase attic ventilation, the relationship is a weak one: Ventilation rates at a given wind speed can vary by a factor of 10. Figure 3. Moist interior air leaking through a hole in the ceiling can produce moldy sheathing or frost on a roof truss. This photo by the author shows results from the Attic Performance Project. Many attic assemblies are built with vents to the outdoors on the presumption that outdoor air will enter the attic and dilute moisture coming from indoors or from the foundation. The further presumption is that indoor air is wet and outdoor air is dry. Both of these assumptions are often false. If there are openings in the ceiling, then air movement in the attic can induce airflow from below, or dilute air from below, or do nothing, in ways that are just plain unpredictable no matter how much research is done. Attic air movement can also induce flow into the living space below, which is a nasty problem when the air conditioning is running. Suppose that the picture of attic ventilation provided by physics, described above, doesn’t quite cut it. Too many qualifications; nothing pinned down. Then we can go to our own observations and experiences, subjective and incomplete as they may be. Here’s my main finding: Attic assemblies built over the last 15 years or so are pretty good. They may be a crapshoot in building-physics terms, but the crapshoot is heavily biased toward good performance. Truss construction seems to do quite well. There are disasters that occur during construction. Truss uplift continues to be a problem requiring cosmetic fixes. The industry has, for the most part, discontinued the use of fire-retardant treatment of truss members, thereby avoiding what was a serious concern for several years. The truss heels in many cases still fail to provide the height necessary for good insulation. Attics have become a forest of truss webs, and thus are less usable for attic storage space. But the overall picture is good (at least by my observations). Gypsum wallboard ceilings have shown improvement. The message seems to have gotten out that ceilings must be airtight — there is no justification, summer or winter, for allowing indoor air or foundation air to pass into attic cavities. The common culprits, such as framed soffits over kitchen cabinets, open oversized plumbing or mechanical chases, and leaky can lights, are going away in most construction where the word has gotten out. Weatherization of existing buildings has kept the focus on closing off any ceiling bypasses. In my experience, most truss-framed attics do fine without special vapor-barrier membranes in the ceiling, but in cold locations, cathedral ceilings may need vapor protection just as walls do. Insulation. Regarding insulation, most areas of the country have healthy amounts in the attic — R-30 in general and R-38 in northern areas. Cellulose provides good insulation and helps block airflow. Fiberglass, in sufficient density and with good installation, also provides good thermal insulation. Foam insulation is being used more commonly, and has become the material of choice for residential air-sealing. Structural insulated panels (SIPs) work fine, as long as the airflow problem at joints is addressed. Foam insulation has been sprayed on the underside of board and wood-panel sheathing with great success. Insulated panels (often polyisocyanurate) make for good roof-deck assemblies, as we know from commercial low-slope construction, where the foam insulation is often sandwiched between the structural roof deck and the roofing membrane. (All foam needs fire protection, of course.) Open-cell foams such as Icynene may need more vapor protection than closed-cell foams, which have greater resistance to vapor flow. Vapor barriers still cause squabbling, but most builders know that moisture flow from below comes mostly through holes in the ceiling. Cathedral ceilings require special care in insulation placement and vapor protection. But the new code provisions should encourage insulated sheathing materials or insulated “sandwich” assemblies that resist moisture transport and heat flow as a package. With these roof assemblies (I call them “insulated vapor retarders” or “fat vapor retarders”), the inside surface stays close to indoor conditions, the outside surface stays close to outdoor conditions, and nothing bad happens in the middle. Our laboratory has had such an assembly in place for more than 15 years, with one inch of foil-faced polyisocyanurate insulation directly beneath the OSB decking; the sheathing gets hot during the day, but the OSB above the foam insulation is the driest sheathing of all. Remember: Hot means dry. Ductwork in unconditioned attic assemblies is not ideal. It’s best to place all ductwork in conditioned spaces. OSB has become the universal sheathing material, by economic and environmental necessity. But we still know too little about the moisture performance of this material, such as under what conditions it will begin to fail. In my laboratory, we have seen the material swell by 50 percent or more under extreme conditions. Will it begin to show signs of sagging between trusses, or will workers be putting their feet through it at the time of reroofing? I don’t know, but the absence of signs of product failure in the field — at least to my drive-by observations — is reassuring. Nevertheless, I look forward to the day when the marketplace provides a product with more clearly established performance characteristics. I’ll be a strong supporter. Shingles. I’m reviewing the condition of the shingles installed on our research laboratory in 1989; after 18 years, signs of aging are appearing. We hope to conduct laboratory tests to pin down and better quantify the shingle performance and the factors that influence it. The aging we see shows some temperature effect: The white shingles are in better shape than the dark, and a few of the most aged-looking shingles are found on the hottest bay, the one with foam directly on the underside of the sheathing. Without the numbers to go by, we must rely on observation, and our observations suggest that performance depends on other factors besides the presence or absence of ventilation and whether the assembly is truss-framed or cathedral ceiling. Of course, natural weathering tests that began 18 years ago say little about shingles that are made today. I sense that the shingle industry is currently producing dimension shingles that seem to lie quite flat, resist wind uplift, and hang on to their UV-protecting granules. I don’t know how to reroof over dimension shingles, and it does seem unfriendly to the landfill to have that much more mass in the shingle. Nevertheless, my drive-by observations show a lot of good-performing shingles going on roofs over the last couple of decades, and that is very reassuring. This discrepancy would be a big deal, I suppose, for someone who felt that vent regulations were critical to attic performance. I don’t, so for me, having vent devices with less airflow than advertised is not a cause for concern. You — and your building code inspectors — may be unaware that the 2006 version of the IRC for one- and two-family dwellings permits attic construction with no ventilation of the attic cavity. This new provision, R806.4, is largely due to the efforts of Joseph Lstiburek, Armin Rudd, and their colleagues. 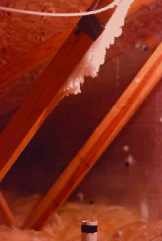 In brief, unvented conditioned attic assemblies are permitted when an air-impermeable insulation such as rigid foam is applied in direct contact to the underside/interior of the structural roof deck, with sufficient thickness — given the climate — to prevent condensation on the underside (see “Insulating Unvented Attics With Spray Foam,” 3/07). This new provision is a direct challenge to the rule of thumb that has been in place for 50 years, which says that you have to vent a steep-roof attic so the ratio of net free vent area to the projected roof area is 1-to-300 (or 1-to-150 when using “cross ventilation” rather than soffit and ridge vents). This ratio arose from observations of frost on protruding nail points in Wisconsin homes by researchers at the Forest Products Laboratory in 1937, and frost on aluminum plates in research “doghouses” at the University of Minnesota in 1938, under “outdoor” conditions of -13°F. The Federal Housing Authority turned these findings into the famous 1-300 ratio in 1942, to be applied as a minimum building requirement for the small homes in its financing program. The requirements were picked up by model codes and others following World War II, and the rest, as they say, is history. Shingle manufacturers did not begin piggybacking their warranties on venting regulations until reports of shingle problems began piling up following the change in asphalt sources in the early 1980s. Every designer and builder should be able to produce good attic and roof assemblies, both with and without ventilation — or anything in between — with just part of a conventional ventilation system. For example, from our studies, roof assemblies that have holes but not necessarily straight airflow paths (one gable end vent, or soffit-only) should also be candidates for good performance. And although unvented roof assemblies can perform well, there are still good reasons to vent: The truss-framed, steep-roof attic with an insulated ceiling has been the workhorse of single-family construction, and ventilation works well with this construction, at least in the northern United States. In some cases, there are also good reasons not to vent: in wildfire areas, in complex cathedral ceiling assemblies, in existing and historic buildings that have never had ventilation, in shed roofs beneath clerestory windows, with foam insulation (foam and ventilation do not go together — think fire), and in complex roof assemblies that combine steep and low-slope construction. I’ve also heard persuasive arguments against venting in hurricane-prone regions, but I’m not an expert in that area. In short, since critical performance doesn’t hinge on ventilation, then either vent, no-vent, or an in-between “kinda”-vent can be taken as the starting point. Whether the choice works or not depends mostly on other factors. So you should vent where venting is appropriate and not vent where it is not appropriate. As it turns out, the worst-performing, most mold-ridden attics I have seen were vented — with a flooded crawlspace and a direct path for air movement from the crawlspace to the attic. You can mess up a vented attic by allowing such airflow. You can mess up an unvented attic as well, usually by not providing vapor protection appropriate to the climate and indoor moisture levels. Tight ceilings would be a great first step toward moisture control, summer and winter. The father of a colleague of mine says that when the word “ventilation” comes out, people stop using their heads. Vented assemblies often perform well, but not always. Sometimes roofs appear to be vented but actually aren’t. Still, we can take comfort in the observation, based on years of experience, that our attic assemblies are pretty darn good, and — in my opinion — they’re getting better. We need to constantly be on the lookout for new conditions and new problems, as they crop up. Those of you working in the trenches should continue to build in a way that complies with code and that you know works for your climate. For more information about ice damming, summer cooling load, shingle service life, and moisture issues, visit www.fpl.fs.fed.us/documnts/pdf1999/tenwo99a.pdf (TenWolde and Rose, “Issues Related to Venting of Attics and Cathedral Ceilings”). For all four of these concerns, ventilation makes a contribution that is generally more positive than negative, but it hardly ever makes the difference between success and failure. For the most part, the focus of codes, researchers, designers, and builders on roof ventilation is misplaced. Instead, the focus should be on building an airtight ceiling, which is far more important than roof ventilation in all climates and all seasons. The major causes of moisture problems in attics and roofs are holes in the ceiling and paths for unwanted airflow from basements and crawlspaces. People should focus first on preventing air and moisture from leaking into the attic. Once this is accomplished, roof ventilation becomes pretty much a nonissue. William B. Rose is a research architect with the Building Research Council at the University of Illinois at Urbana-Champaign, and the author of Water in Buildings: An Architect’s Guide to Moisture and Mold. This article was adapted from The JLC Guide to Moisture Control.